Southern Matriarch: Clang, Clang, Clang Goes the "Streetcar"
Now I know the lyrics say "trolley" but our little NOLA babe won't know them as trolleys. To him they will be streetcars. An iconic symbol of the Big Easy is stitched here alongside the equally universal New Orleans symbol, the fleur de lis. What says New Orleans better? 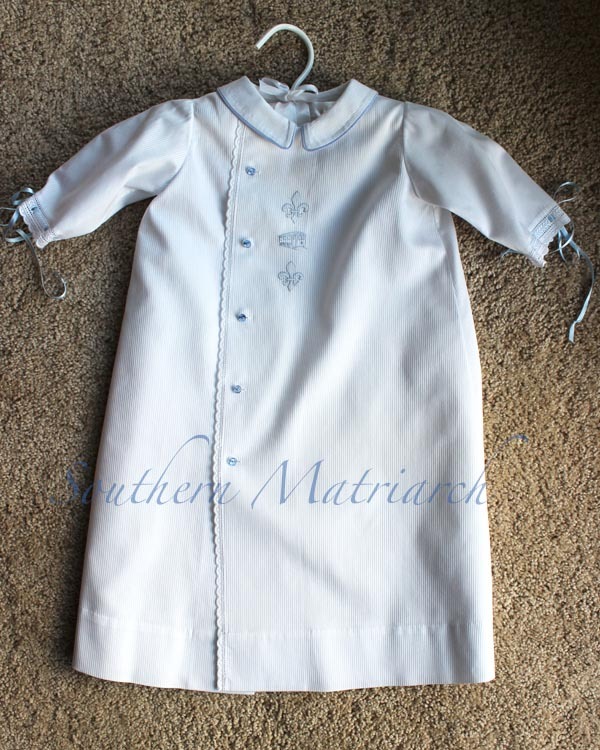 This is baby's "Coming Home" gown. Embroidery is worked with Cascade House silk floss. 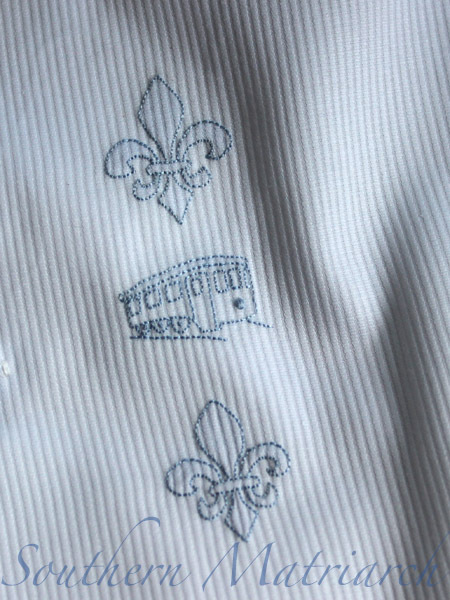 The fleur de lis are shadow work and the streetcar is a combo of shadow work and backstitch. A granito is his headlight. The gown is a combo of Kathy Neal's "Neal's Nightshirt" and Old Fashioned Baby "Baby's Summer Clothes." Fabric is a ribbed pique I purchased from Old Fashioned Baby a couple of years ago. Swiss trim edges the off-set placket and sleeves. 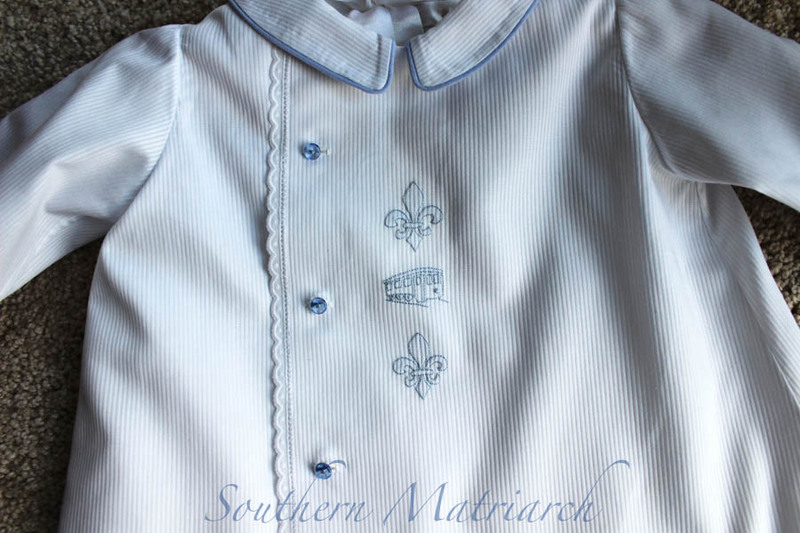 I used blue piping for the collar and antique glass buttons. Baby's mom loves it. I will admit, I am less than thrilled with it. I haven't convinced myself I won't re-do the whole thing. We will see. And for your enjoyment, a little clip about "streetcars." It's perfect, Martha. I love it. Martha the gown is wonderful. I am not sure what your seeing that doesn't thrill you but from the pictures the gown looks perfect especially love the embroidery and the glass buttons. Your creativity really shines with the simple lines of the gown. It really is precious, Martha! Such a beautiful gown full of symbolism for your family. Lovely! My heart thrilled to see the streetcar design. My daddy was a motorman (he drove) on the St. Charles line. Streetcars always remind me of him. Thank you.